Edited by Chris Richardson and Romayne Smith Fullerton. 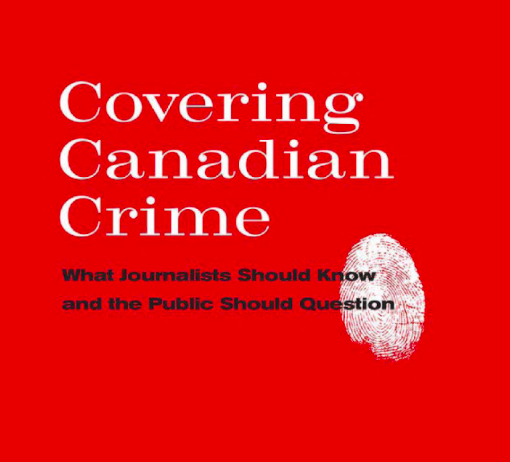 Covering Canadian Crime: What Journalists Should Know and the Public Should Question. University of Toronto Press, 2016. 440 pages, $26.96. Crime stories are often some of the worst stories to tell, which invariably makes them some of the best as a journalist. A mother who longs for her missing daughter, the ingenious sting that unwinds a criminal enterprise, or the child killed by a drunk driver, crime stories are often fascinating, emotional, engrossing reads that reveal something of the individual and humanity as a whole. With such candor, Appleby is one of the voices captured in Covering Canadian Crime: What Journalists Should Know and the Public Should Question. In the introduction, editors Chris Richardson and Romayne Smith Fullerton say their intent was to be less how-to—although some of the chapters inevitably offer guidance, such as the art of the “death knock”—and more focused on the whys of crime reporting in hopes of sparking debate about how it could be improved. The book is a series of essays, some by or about those working inside the profession and others by scholars looking critically at it. They’re divided between three themes: The Routines and Realities of Canadian Crime Reporting; Court Access and Information Technology; and Constructing Criminals and Crime News. As several of those working journalists point out, crime reporting is often the entry level position in a newsroom, assigned at times to the most junior of reporters. I remember overhearing a young reporter, fresh out of J-school, making calls about a murder-suicide in a small town with the same tone of voice and approach you’d use to inquire about the new rising star in town. Little surprise she came up empty. “Journalists receive very little training on how to confront people at the worst points in their lives,” crime-reporter-turned-thriller-writer Rick Mofina points out in one of the chapters. Working journalists will find some of the most engaging chapters are those sharing the insights of reporters who have been there on the frontlines, such as Christie Blatchford’s observations on what really goes on in a courtroom; Kate Dubinski tweeting from the Bandidos murder trial; Peter Edwards on reporting about Ipperwash; Linden McIntyre on accessing court records; Kim Bolen’s legendary blogs that began when she stood outside the gate to a biker party; or Mofina on the faces behind the tragedies. Followers of crime reporting will appreciate the behind-the-scenes insights and internal struggles in such high profile cases as Col. Russell Williams trial, the murder of Tori Stafford, Robert Latimer case, and the shooting of Dudley George. Interspersed between the journalists’ perspectives are scholarly essays that challenge crime reporters and the public to think about how those stories are told, whether it’s examining the evolution in courtroom tweets or in raising issues of gender, racial or class bias. The editors suggest that reporters, in their choice of which facts to pursue or which research on which to focus can “construct fears, point to patterns that may not actually exists, and perpetuate dangerous assumptions about certain people, places and phenomena.” They also note that some of those critical issues and questions get lost in the shuffle of pressing deadlines or the instantaneous demands of today’s media. But whether exploring the gut-wrenching task of cold-calling someone who has suffered a loss or debating the merits of not naming suspects or analyzing approaches to mental illness and violence in reporting, Covering Canadian Crime makes for compelling reading—much like a good crime story. Barb Pacholik has been covering court and crime for the Regina Leader-Post for nearly three decades. She is also the author of three true crime books about Saskatchewan. Disclosure: Romayne Smith Fullerton is J-Source’s ethics editor.